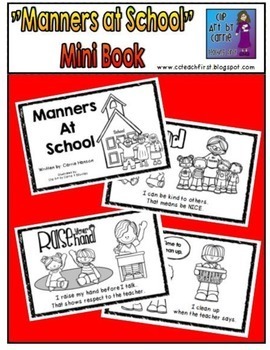 This book includes 6 PRINTABLE mini books to used to help teach PBIS expectations at the beginning of the school year or throughout the year as you reteach. **Note: These are formatted for easy printing on the copy machine for paper copy mini-books. There are two of the same sheet per page, so simply select double sided, sort, staple, then cut in half for easy printing a class set. **Note: These are NOT the digital version of these books to view and read in iBooks or any PDF reader, as there are two of the same mini-book page on each printable sheet. Manners are important. Here are some good manners on the school bus. To be safe I will stay seated and face the front. I will keep myself and my stuff out of the aisle. It keeps everyone safe. My head, hands, feet and all objects stay inside the bus to keep me safe. When I wait for the bus I will be peaceful. That keeps everyone safe. When I’m on the bus, I will use a quiet voice and talk about nice things. That is being respectful to others. I will follow directions and listen to the bus driver the first time. That shows respect to the bus driver. I can be responsible by being on time. I don’t want to miss the bus! I will be responsible and clean up after myself. I can tell the bus driver if something is broken or if there is a problem on the bus. That is being responsible. Doing your best and following the rules on the bus keeps everyone happy! Manners are important. 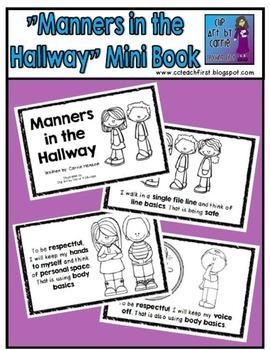 Here are some good manners in the hallway. I walk in a single file line and think of line basics. That is being safe. To be respectful, I will keep my hands to myself and think of personal space. That is using body basics. I will keep to the right. That is being safe. I will go right to where I need to go. That is being responsible. To be respectful I will keep my voice off. That is also using body basics. I will remember to use walking feet. That is being safe and using body basics. I will greet others with a friendly wave. That is being respectful. and keeping the hallway clean. Manners are important. Here are some good manners in the restroom. I will wait my turn to respect others’ privacy. I show respect by using a quiet voice. I show respect by respecting school property and leaving the lights on. To be responsible I can flush the toilet when I’m done. I will think 2 for pumps of soap, towels, and minutes. That is being responsible. I wash my hands with soap and water to stay safe. I can do my best by keeping the bathroom clean. To be responsible I can report problems to the teacher. Good manners and making good choices in the restroom keeps everyone happy! Manners are important. 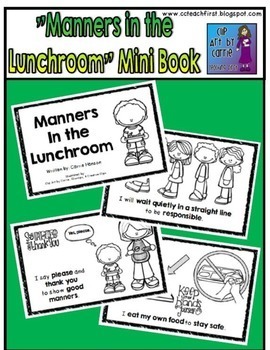 Here are some good manners in the lunchroom. I will wait quietly in a straight line to be responsible. I say please and thank you to show good manners. I use walking feet coming in and out to stay safe. I think of line basics. I keep hands and feet to myself to stay safe. I think of body basics. I eat my own food to stay safe. I show respect by using a quiet voice and talk about nice things. I show respect by listening to the teachers. I can be responsible by cleaning up after myself when I am done eating. I will raise my hand when I need something. That is being responsible. To do my best I can try everything on my tray. Manners are important. Here are some good manners on the playground. I can stay safe and play in the right place. Once I’m out, I stay out. I will use things the right way to stay safe. I use walking feet coming in and out to stay safe. I can take turns, share, and be kind to show respect. I wait my turn on the swings. I take turns. I share with others. That shows respect to my friends. I can be kind to others. That means be NICE to show respect. I will let others play with me. That is respect. I show respect by listening to the teacher the first time. I will be responsible and line up when the bells rings or the teacher blows the whistle. I can be responsible and put things away when I am done with them. Good manners and making good choices on the playground keeps everyone happy! Manners are important. 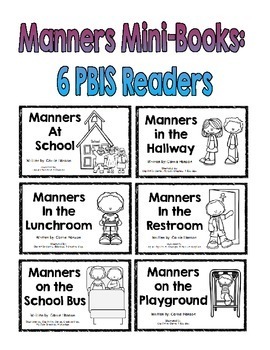 Here are some good manners at school. I can be kind to others. That means be NICE. I can look with my eyes and listen with my ears. My lips are zipped when I listen. That shows respect. I keep my hands to myself. That is my personal space. I raise my hand before I talk. That shows respect to the teacher. I cover my mouth when I cough. No one wants my germs! I clean up when the teacher says. Good manners at school keeps everyone happy! Save by buying all 6 together!